14k yellow heart shaped earrings with 1.1300 ct of diamonds. Romantic earrings with diamond dazzle! 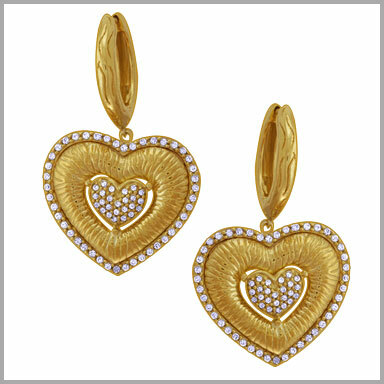 These earrings are made with polished 14K yellow gold and each feature 69 round cut diamonds pave set in a heart shaped design. The total diamond weight is approximately 1.1300ct (color: G-H, clarity: SI). They measure 1-1/2" x 1"and have posts hinged backs.